The 2015 edition of the Global Risks report completes a decade of highlighting the most significant long-term risks worldwide, drawing on the perspectives of experts and global decision-makers. Over that time, analysis has moved from risk identification to thinking through risk interconnections and the potentially cascading effects that result. Taking this effort one step further, this year’s report underscores potential causes as well as solutions to global risks. Not only do we set out a view on 28 global risks in the report’s traditional categories (economic, environmental, societal, geopolitical and technological) but also we consider the drivers of those risks in the form of 13 trends. In addition, we have selected initiatives for addressing significant challenges, which we hope will inspire collaboration among business, government and civil society communities. A trend is defined as a long-term pattern that is currently taking place and that could amplify global risks and/or alter the relationship between them. The Global Risks Landscape, a map of the most likely and impactful global risks, puts forward that, 25 years after the fall of the Berlin Wall, “interstate conflict” is once again a foremost concern (see Table 1). However, 2015 differs markedly from the past, with rising technological risks, notably cyber attacks, and new economic realities, which remind us that geopolitical tensions present themselves in a very different world from before. Information flows instantly around the globe and emerging technologies have boosted the influence of new players and new types of warfare. At the same time, past warnings of potential environmental catastrophes have begun to be borne out, yet insufficient progress has been made – as reflected in the high concerns about failure of climate-change adaptation and looming water crises in this year’s report. These multiple cross-cutting challenges can threaten social stability, perceived to be the issue most interconnected with other risks in 2015, and additionally aggravated by the legacy of the global economic crisis in the form of strained public finances and persistent unemployment. The central theme of profound social instability highlights an important paradox that has been smouldering since the crisis but surfaces prominently in this year’s report. Global risks transcend borders and spheres of influence and require stakeholders to work together, yet these risks also threaten to undermine the trust and collaboration needed to adapt to the challenges of the new global context. The world is, however, insufficiently prepared for an increasingly complex risk environment. For the first time, the report provides insights on this at the regional level: social instability features among the three global risks that Europe, Latin America and the Caribbean, and the Middle East and North Africa are least prepared for. Other societal risks, ranging from the failure of urban planning in South Asia to water crises in the Middle East and North Africa, are also prominent. And capacity to tackle persistent unemployment – an important risk connected with social instability – is a major concern in Europe and sub-Saharan Africa. Interplay between geopolitics and economics: The interconnections between geopolitics and economics are intensifying because states are making greater use of economic tools, from regional integration and trade treaties to protectionist policies and cross-border investments, to establish relative geopolitical power. This threatens to undermine the logic of global economic cooperation and potentially the entire international rule-based system. Urbanization in developing countries: The world is in the middle of a major transition from predominantly rural to urban living, with cities growing most rapidly in Asia and Africa. If managed well, this will help to incubate innovation and drive economic growth. However, our ability to address a range of global risks – including climate change, pandemics, social unrest, cyber threats and infrastructure development – will largely be determined by how well cities are governed. Governance of emerging technologies: The pace of technological change is faster than ever. Disciplines such as synthetic biology and artificial intelligence are creating new fundamental capabilities, which offer tremendous potential for solving the world’s most pressing problems. At the same time, they present hard-to-foresee risks. Oversight mechanisms need to more effectively balance likely benefits and commercial demands with a deeper consideration of ethical questions and medium to long-term risks – ranging from economic to environmental and societal. 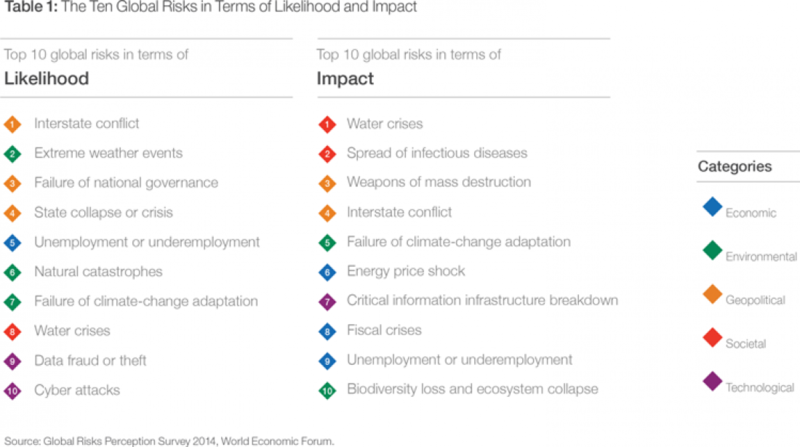 The Global Risks Perception Survey 2014 gathered the perceptions of almost 900 members of the World Economic Forum’s multistakeholder community between July and September 2014. Mitigating, preparing for and building resilience against global risks is long and complex, something often recognized in theory but difficult in practice. Against this backdrop, Part 3 features three proven or promising initiatives that were instituted in response to extreme weather events and climate-change adaptation. The modelling of the Murray-Darling Basin river system in Australia has pioneered innovative methods of water management that are now being adapted for use elsewhere in the world. The Resilient America Roundtable is currently helping selected local communities across the United States to understand how they might be affected by different risks and then design resilience strategies. ZÜRS Public, part of an extensive flood management programme in Germany, is a public-private collaboration that for several years now has been a tool for communicating with homeowners and businesses about their exposure to flood risk. Over the past 10 years, the Global Risks report has raised awareness of the dangers from the interconnected nature of global risks and has persistently called for multistakeholder collaboration to address them. By offering a broad-ranging overview from risk identification and evaluation to practices – from the “what” to the “how” – this year’s report aims to provide the most comprehensive set of insights yet for decision-makers in its decade-long history.